After helping lead Mountain Brook to the state 6A basketball championship in 2013-14, Alex Peters had a problem. Peters – a 6-8 forward – wanted to continue his career in college, but most major schools had overlooked him. “I had talked to some (NCAA) Division III schools, and Loyola of Chicago was interested, but that was about it,” he recalled, when contacted last week. So after deliberations with coaches and family, Peters made a decision; he would attend Samford University as a walk-on basketball player and try to earn a scholarship. Photo courtesy of Samford University. Neither party has ever regretted the decision. Peters made an immediate impact as a freshman, earning playing time in 31 games – including eight starts – and shooting 55 percent from the field and blocking 12 shots. His best game may have come in a Bulldog loss to Louisiana Tech, when he scored 10 points with eight rebounds and two blocked shots. Despite coming from one of the top high school basketball programs in Alabama, Peters admitted that the differences in the game at the college level were dramatic. Peters was off to a similar start in 2015-16, coming off the bench to average three points and two rebounds per contest. The bad news came on Jan. 14, when he suffered an injury while diving for a loose ball early in a loss to Eastern Tennessee State. He was given a standing ovation from the home crowd at Pete Hannah Arena as he was taken from the court on a stretcher. Peters is expected to return to action soon. The injury was disappointing but Peters isn’t the type to dwell on the past. He’s much more likely to savor the fact that he is playing basketball at the major college level. A highlight may have been Samford’s 69-58 upset of Big Ten power Nebraska late last year. Peters enjoys playing for Samford coach Scott Padgett. Long-time Spartan fans aren’t surprised at Peters’ success at Samford. He was a mainstay of the 2014 state champions, averaging nine points, five rebounds and three blocked shots per game. His best performance may have come in a victory over highly regarded Wenonah, when he scored 23 points with nine rebounds and nine blocked shots. Peters credits the work ethic he learned at Mountain Brook as a key ingredient for his success in college. Although Peters is busy, he still occasionally finds time to get away and see the Spartans play. Peters may enjoy watching his former team play, but his primary focus is on the here and now at Samford. And he has one team goal: to help the Bulldogs reach the NCAA Tournament. “It’s every college basketball player’s goal to play in the Big Dance,” Peters said. “To get there would be a dream I’ve had since I was a kid. I can’t imagine anything in basketball that would be more fun. 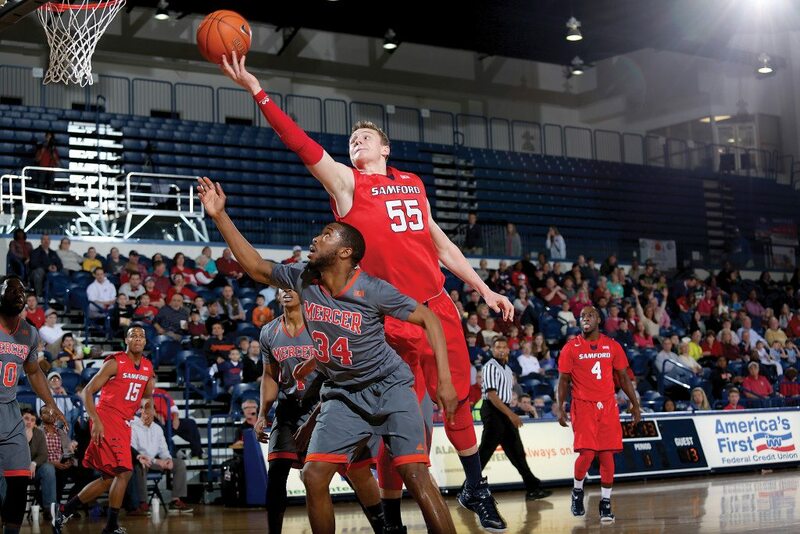 If Samford does reach the Big Dance, it’s very likely that the dream – and hard work – of Alex Peters will be a big reason the Bulldogs get there.